A great man is better than a sweet smelling perfume. The perfume will go away but the man’s legacy will remain. These were the words by Reverend Jack Moha to the late veteran journalist Susuve Laumaea during Mr. Laumaea’s funeral this morning. 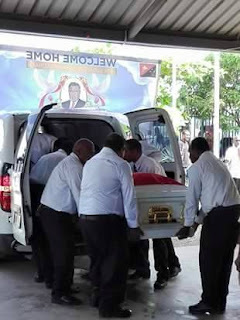 More than 200 people including the Prime Minister, media personals and the immediate family of the late veteran journalist and advisor to the Prime Minister Susuve Laumea attended the funeral of the veteran journalist to farewell him. The funeral service of the late veteran journalist Susuve Laumaea was held this morning at the Sione Kami Memorial Church. PM Peter O’Neill who was present at the funeral described the late Mr. Laumaea as a great contributor to the country. PM O’Neill thanked the late veteran journalist family for sharing their late father.